Visio Tower (VO4) is the latest component in Velocity development offering large floor size office space for rent. It was completed in Q4 2018 and it is currently home to Shaklee Malaysia. This low density tower is 15-storey high and is built to MSC Compliant specification. Complete with multi tier security system and energy efficient lighting, Visio Tower is Green R.E certified. Covered walkway and elevated bridge connecting to Cochrane and Maluri MRT Station (SBK Line) and in future Chan Sow Lin Station (SSP Line) ensure pedestrian is safe commuting with public transport. Sunway Velocity development will have Medical Centre and Residential Tower, creating a self sufficient environment to stay and work. 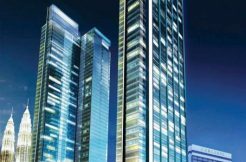 Companies looking to be operating just out of KL CBD will consider Visio Tower, as it is located just 6km away from KLCC. Floor size of approximately 16,000 sqft will definitely meets the requirement of GLC, and MNC.